Some of the children's books on Native people available in Switzerland book stores. I brought the wrong wardrobe. Within Native circles, we sometimes joke about what people expect us to look like. And when we don't, they think we aren't "real" Indians. 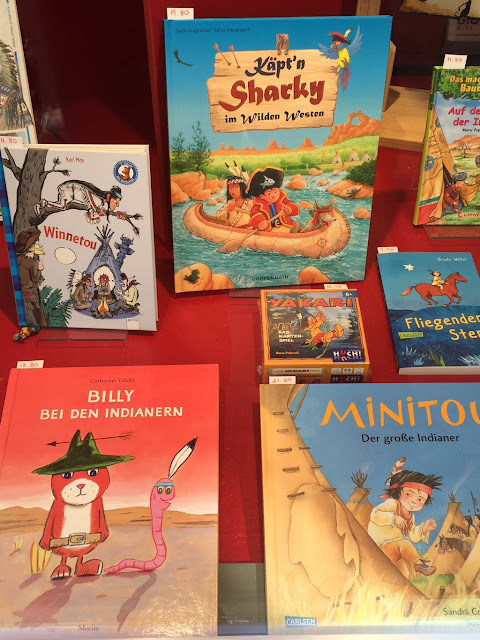 Depictions in children's books, no matter where they are published, carry a lot of power. They shape those expectations, and because those images are so bad, are a reason I write about them so much. It isn't one image here or there. It is pervasive. Some of the words on the covers ("Minitou" and "Winnetou") tell me the people who wrote, illustrated, and published those books were/are deeply influenced by Karl May's stories, which were nothing more than stereotypes of Native peoples of the U.S. I may see if I can get copies of one of those books, or at least see some of them online in greater detail. If you know of others, let me know. They are worth studying, for those of us who study stereotypes, but I think their factual misrepresentations mean they ought not be given to young children. There are many great books, Taylor's included, that you can give to them! See the lists at my Best Books page. If you like scary books, or know a teen who does, give them Taylor's The Night Wanderer. I vividly recall reading it, in a hotel room at a Native writer's conference. Once the sun went down, I did not want to look out the window. 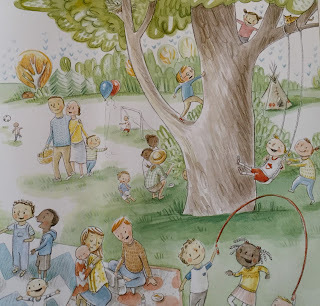 Kelly DiPucchio and Mary Lundquist's one little two little three little children arrived today. You may recall I wrote about it recently in my "Debbie--have you seen" series. Published by Balzer & Bray (an imprint of HarperCollins) in 2016, it is definitely going onto my not recommended list. And I concur with Kirkus's reviewer. 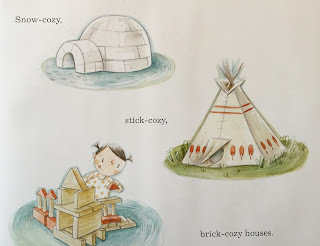 Having that "snow-cozy" igloo and that "stick-cozy" _____ on the same page as a child playing with blocks is a misstep. Kirkus called that stick-cozy item a teepee and on Twitter I said tipi, but in retrospect, I was wrong to call it a tipi. 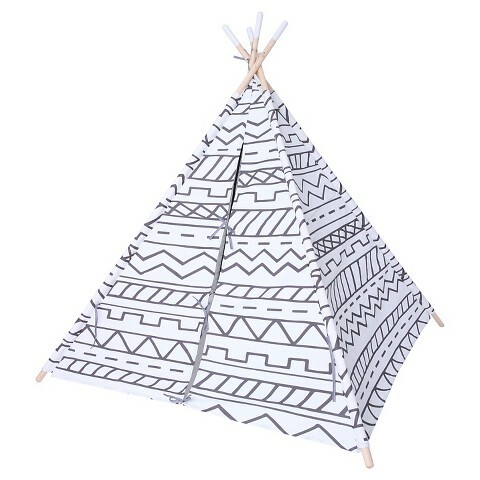 It isn't a tipi. It is a THING. A toy. Just like the ones you see at department stores. In fact, I look at that "stick cozy" and think that Lundquist might have used one of the department store items as a model for her "stick-cozy." See? Then, Lundquist put that "stick-cozy" over in the park, too, where everyone is playing. Why? So they can.... play Indian?! Course, I don't see anyone in feathers but it isn't a big leap to imagine kids doing that very thing. DiPucchio's text is, the synopsis says, an "exuberant reinvention of the classic children's rhyme." An adult reading the book aloud can "sing" it using that "one little, two little, three little..." tune. You know which one it is. 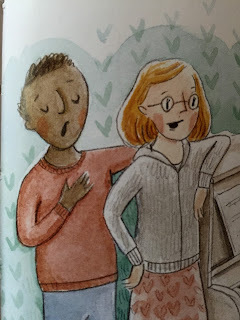 The Kirkus reviewer wonders if this is meant to be a multicultural book. I think they're right. The families/couples shown on the pages include this one, which is great. Overall, though, I think it is one of those books that throws Native peoples under the bus. It asks us to celebrate multiculturalism using a racist tune as we gaze at illustrations that infantilize a Native structure. There's absolutely no reason for this. None. I do not recommend DiPucchio and Lundquists "exuberant reinvention" of the racist "One little two little three little Indians" rhyme and hope you reject it, too. Sherman Alexie won't sell movie rights to his books b/c he doesn't want his books whitewashed and non-Native actors #thebookcon. What name would you choose if you were a Native American? Although Native Americans gave their children names just as your parents did for you, they were very different. They also may have many names throughout their life. The elders named the children and adults within the tribe. Some came as dreams or visions from the elder which was a sign for naming the person. Others go along with the personality or characteristic of that person. A Native American name may tell about what the person does well or wants to do, something that may have happened on the day of that person's birth, or something else that has specific meaning relating to that person. Sometimes Native Americans didn't like their names because they may have been degrading. For example: Would you like to be called Talks Too Much, Buffalo Woman, Lonely One, Lazy Elk, or No Particular Tribe? Since animals were a large part of their religious world, they were often used when naming a person. For example: Running Deer, Brave Hawk, Thunder Bird, Quiet caterpillar, Wild Cat, Sly Fox or Swimming Dolphin. Part of the nature were common too since Native Americans worshipped their land. For example: Strong Wind, Running Thunder, Lightning Bolt, Shining Sun or Happy Weather. Once the elder named the child or adult, they have a ceremonial feast and that elder and newly named person formed a bond. Now it is your turn! A Native name can say quite a lot about you! Give it a try! Write your name and a description of why you chose your name on the template. In the box, draw a picture of yourself as a Native American. Below there is a circle. Here you will create a symbol for your name. Since they didn't have an alphabet or written language they often used symbols to write their names. Make it simple! Too much detail would take too much time to write your name over and over again! I uttered one "oh my gosh" after another as I read that worksheet (where did the author find those names, and why is "Buffalo Woman" seen as degrading?! ), but let's stick with my concern: the monolithic or pan-Indian character of that worksheet. There are over 500 federally recognized nations in the United States. Amongst them is tremendous diversity of language, ceremony, and yes, naming. I see my students on these pages, most especially my favorite, with the male grass dancer regalia, and wish there were more chances for them to see themselves, and others to see them, in the pages of picture books. I appreciate the book, and feel it is important, but wonder if it may somewhat confuse those who haven't been taught about cultural naming traditions. Might they read this and see it as a silly thing instead of the deeper meaning usually given to it? Because of that, I wish there had been an end note to add some more perspective within the larger conversation. Kudos to Jillian! She's got the context to understand why the lack of specificity in the book is a concern. In emails with Roger Sutton a couple of days ago, we briefly touched on my review of Alexie's book. He said "how we respect insiders and outsiders at the same time" is "a big question." I think we all want to get to a place in children's literature, textbooks, movies, etc. where we're all represented, accurately, and where students and consumers don't need help understanding the cultural, religious, history, etc. of the story or information being conveyed. In many places, for example, I've applauded Daniel Jose Older's video asking writers not to use italics for non-English words. He's pushing the status quo in terrific ways. Given the shifting demographics in the United States, that place (where things aren't so darn white) is going to come, eventually. We're getting there. In the meantime, for some peoples and some topics, readers are going to need some help, within the pages of the book. Thunder Boy Jr. is a perfect example of the need for that help. I bought three copies of the 100,000 that were printed. One of them is mine, one is for Jayden (my sister's grandson), and the third copy is for his class. It is a class of Pueblo Indian children who probably have gone through their naming ceremony. We (I'm Pueblo, too) have specific ways in which we receive our names. My parents named me Debbie when I was born. A few weeks later, I received a Pueblo name. I'm not going to provide details about that because ceremonies are not something we disclose. There are reasons for that, including the fact that our religious ceremonies (naming is part of that) were outlawed by the US government. Another is that people who are searching for identity and meaning in their lives gravitate to Native peoples and "go Native" in superficial ways that are harmful to Native peoples. The children in that classroom, secure in who they are (like Jillian's students), will likely enjoy the story. As I've noted, 100,000 copies of the book were published. I'm hoping that Little, Brown (the publisher) will include a Note in the next batch, providing a "do not use this book as an activity for which kids pick a Native American name," an explanation for why that is not a respectful activity, and a bit of information about Native naming. If you've got a copy, or if you get one of the 100,000 copies, I hope the information I share here is helpful. Inevitable: Tweet from someone who read Alexie's Thunder Boy Jr. to kids and then did activity where kids picked their Indian names. Fact: Imagine being a Native kid in that class, who already has a name, given to them in ceremony, being asked to make up a new one. Question: Would it help adult readers NOT do that activity if there was a note inside the book about Native peoples and naming? 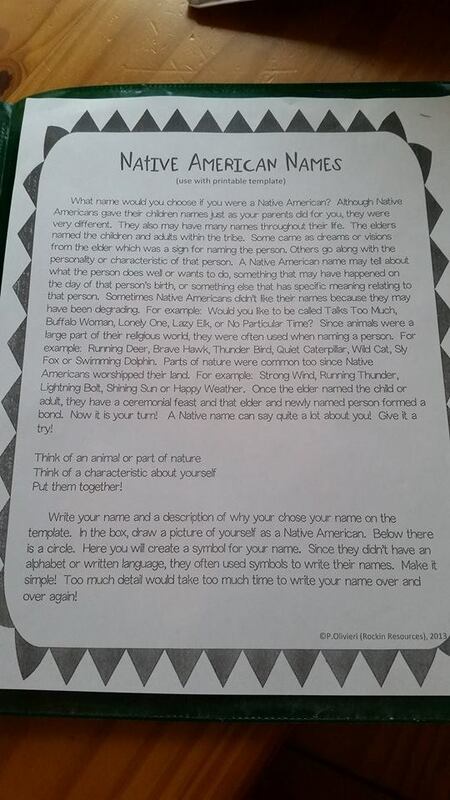 A truth: A white teacher asking a Native kid to choose a new name harkens back to boarding schools where teachers asked Native kids to point to a blackboard to choose a new name. Lakota children are named at birth by their parents or by close relatives. Standing Bear's brothers' names, Sorrel Horse and Never Defeated, signified brave deeds that their father had been known for: he once had a sorrel horse shot out from under him, and he displayed heroic characteristics in battle, causing the people to remember him as never having been defeated. As Standing Bear later recalled, "In the names of his sons, the history of [my father] is kept fresh." Standing Bear's father was a leader who killed many to protect his people. Thus, like his brothers, Ota K'te (Plenty Kill) was also given a name that held significance. Ota K'te kept his boyhood name until it changed to Mato Najin, or "Standing Bear," later in his life, according to Lakota custom. In the old tradition, he would have earned a new name through a heroic or brave deed, but by the time he reached an age when he could prove himself worthy, the Lakota people had been confined to the Pine Ridge Reservation. He took his father's name, Standing Bear, and at Carlisle Indian Industrial School in Carlisle, Pennsylvania, he took the name Luther. 'Do you see all these marks on the blackboard? Well, each word is a white man's name. They are going to give each of you one of these names by which you will hereafter be known.' None of the names were read or explained to us, so of course we did not know the sound or meaning of any of them. The teacher had a long pointed stick in her hand, and the interpreter told the boy in the front seat to come up. The teacher handed the stick to him, and the interpreter then told him to pick out any name he wanted. The boy had gone up with his blanket on. When the long stick was handed to him, he turned to us as much as to say, 'Shall I--or will you help me--to take one of these names? Is it right for me to take a white man's name?' He did not know what to do for a time, not uttering a single word--but he acted a lot and was doing a lot of thinking. Finally he pointed out one of the names written on the blackboard. Then the teacher took a piece of white tape and wrote the name on it. Then she cut off a length of the tape and sewed it on the back of the boy's shirt. Then that name was erased from the board. This went on for all the kids. In class when the teacher called the roll and the person whose name she called didn't stand, she'd look at the tape and make that child stand up and say 'Present.' That is how they learned what their new names sounded like, and that they should respond to the name when it was said. All of that information is specific to Luther Standing Bear and Lakotas. I understand that Alexie, in his classroom visits, is telling kids that the boy in the story is Spokane. Speaking as a teacher, I would love to see that in the book, and information about the ways that Spokane's name their children. At some point in the future, my hope is that the diversity within Native America will be common knowledge, and such notes won't be necessary. We aren't there, yet, and while I don't want Native writers to feel a responsibility to explain things to non-Native readers, I think it is, for now, necessary that their books include helpful notes. Providing that information in a Note to Readers respects the writer's way of telling a story as they choose to tell it, and respects the outsiders need for more information with which to understand that story. It is one answer to Roger Sutton's question about how we can respect insiders and outsiders at the same time. Carter Revard's Traditional Osage Naming Ceremonies in Swann and Krupat's Recovering the Word: Essays on Native American Literature (1987, University of California Press). Anton Treuer's "What are naming ceremonies?" (especially the part about Ojibwe naming) in Everything You Wanted to Know about Indians But Were Afraid to Ask (2012, Borealis Books). Previous posts on Thunder Boy Jr.
May 12, 2016: How to Read Sherman Alexie's Thunder Boy Jr.? May 13, 2016: More questions about Sherman Alexie's Thunder Boy Jr.
Labels: Jillian Heise, Luther Standing Bear, Personal names, Roger Sutton, Sherman Alexie, Thunder Boy Jr.